*I received a free product in order to do a product review. All opinions are honest and my own. Oh my gosh! I am so excited to tell y'all about this great product! I've been wanting one for a while but never got around to ordering one for myself. So, I was really pleased when I was asked to do a review of the Mighty Handle! 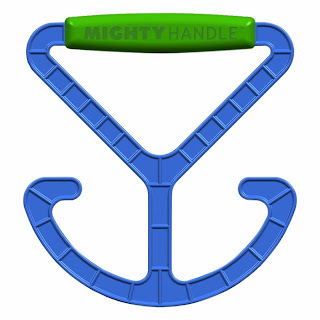 Anyone that shops NEEDS this nifty gadget whether it's for our daily shopping routines or for the busier holiday shopping the Mighty Handle is a helpful tool to have on-hand! Especially if you are out shopping with a baby or small child! Shopping the mall (or grocery store) was so much easier when Grace was still in a stroller or shopping cart. One of us would carry the bags while the other pushed the stroller. Now that Grace is bigger, she wants to walk the mall herself. Which causes much more chaos. Grace takes turns walking with each of us, causing us to trade off the bags quickly as we try to keep up with her! This often means dropping a bag or tearing a handle, leaving whichever one of us that is left with the bags, to shuffle our purchases into other bags while the other is catching up with Grace. Or, have you ever tried to carry too many, too heavy bags at once. Pinching your fingers or forearms, turning them purple and sore just so you wouldn't have to make another trip? Ouch! Mighty Handle makes it easy to carry more bags at one time. Just loop the bags over the hooks and carry by the padded handle! So easy...and no pinched fingers! The anchor design of the Mighty Handle evenly distributes the weight of your purchases allowing you to carry up to 50 lbs. in one hand! Yes, I know that re-usable tote bags would be an easy solution, but quite honestly, I'm just not that organized! After getting Grace and myself ready for an outing, I barely remember to grab my coat while rushing out the door let alone a stack of reusable shopping bags! That's why Mighty Handle is so great! With today's bigger purse trends, it can easily fit into your purse so you have it whenever you need it! After slipping the bags off of the Mighty Handle, I just put the handle right back into my purse ready for the next time! Would you like to win your own Mighty Handle? Entering to win is easy using the Rafflecopter entry form below! Oh, this would be excellent for me. Especially getting the bags from the car into the house. Instead of a zillion trips and struggling. I'd love it! I plan to use the handle to carry more groceries upstairs instead of making so many trips.